General Entry Now Closed – Grovel nicely and you can get an “I know I’m an idiot for not entering on time, please sir may I have an entry? ” entry – You will get a Dog Tucker number plate and there won’t be any goodies in your bag! The run will be open to anyone 13 years and over however anyone under 16 MUST BE accompanied by an adult who shall be responsible for ensuring they are able to safely accomplish the two crossings of the Clarence River. 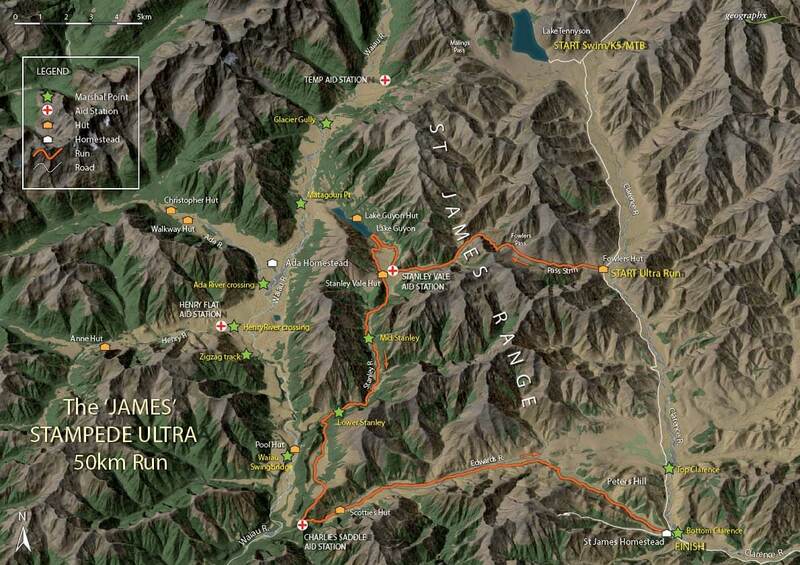 Runners will start the 50 km run with an immediate gradual climb all the way to the top of Fowlers Pass. From the top of Fowlers (4.5km) there is a sharp drop following a zigzag track down into a tributary of the Stanley River. Following the creek down runners will soon cross the Stanley for the first of 11 times! At around the 12 km mark runners start the new loop to Lake Guyon and back to the first major aid station (16km) prior to passing by the historic Stanley Vale hut. Continuing down the Stanley River for another 12 – 15km runners will experience several more river crossings and a couple of minor climbs/descents before a big climb out of the Stanley up onto “The Racecourse”, traversing “The Racecourse” runners will complete another climb up onto the tops above Scotties Camp and the Edwards River. From here they will have a significant descent (the bums rush) – following a steep tussock spur with no track, down onto the Edwards 4×4 track and the 2nd major aid station – just below Charlie’s Saddle at about the 34km mark. From here runners will follow the 4×4 track up the Edwards valley (crossing the river 3 times) where (at around the 44km mark) they will have one last short-sharp climb up into Peter’s Valley from where they will have an overall descent via Peters Valley, into the finish at the St James Homestead. When we say Come run with the wild things we mean it – there is every chance of seeing Chamois, red deer, wild pigs and many different bird species including if you’re really lucky Kea and falcons. Race briefing will be at 6:50am with the race start at 7am – all competitors must attend the briefing. Aid Station Distances – Aid stations will be located at approximately the 16, 32.5 & 44 km marks. Approximate distances between stations are; Start to 1st station (Stanly Vale) 16km, from there to 2nd station (Charlies Saddle) 16km and from there to 3rd station (Bull Gully mini) 11km and from there to finish 6km. Anyone who is unable to meet these conditions should notify The Yeti (theyeti@stjamesmountainsports.co.nz) to make other arrangements.